Aloha! I spent last week in Kalaupapa, a northern peninsula on the island of Molokai in Hawaii. I’ve been helping a fellow graduate student out with his dissertation research on the historic lepertorium here on the island. It’s particularly relevant as Farther Damien, a missionary who came to the island and ended up getting leprosy himself, is getting sainted and then the whole peninsula–hereto mostly isolated–will go mad. Access to the peninsula is limited to a small plane and a steep hike up the highest sea cliffs in the world. I went top-side for the weekend, up all 29 switch-backs, picking ripe guava along the way to snack on. During my first week here we worked at a site that had a chimney still standing. The locals speculated that it had been a bakery, but the archaeology seems to indicate otherwise. We opened up a few test units and found a lot of nails and a huge concentration of melted glass–much more than at surrounding sites. Any ideas? In one of the test units I found what looked like a foundation–stacked stones with just a bit of mortar sticking to one of them–but it didn’t pan out in the other units that we opened up surrounding it. 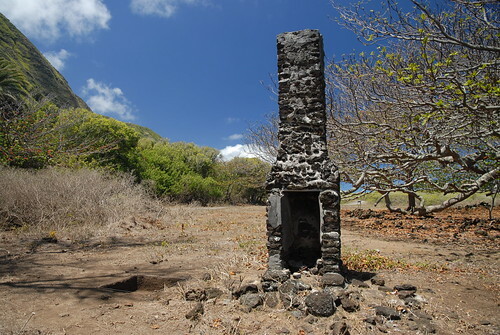 It’s a bit difficult to look for architecture here, as it’s made out of black a`a` (a kind of lava rock), which is all over the place on the island and typically robbed to create other structures and kicked around a lot. We also planned and tested a site that was post-on-stone construction in the middle of a large date palm forest. The trees kept dropping fruit all around us and the ground was just positively hair with roots. Kalaupapa has been amazing like that–we eat frest fish, breadfruit, oranges, and avocados that we gather ourselves and that the locals share with us. It has been an incredible experience getting to know the community and the archaeology, not to mention being able to jump in the gorgeous clear blue-green ocean each day after work! Unfortunately I was only able to get a few photos uploaded, due to the vagaries of internet access (and no cellphone signal), but I should be able to share more once I am back on the mainland. With very little to go on but appearance – any chance it might have been a kiln of some sort? The bit of a possible foundation might belie that though. But hey, you asked! Were they doing any medical stuff with the people? would they have required glass cylinders and test tubes and the like? maybe they produced for themselves–a glass blowing works of some sort.